I extend my warmest greetings to all our Christian brethren on the occasion of Christmas. Much more than festivity and celebration, the spirit of Christmas is to share, to reach out, and to love all humanity. Jesus Christ brought and preached the message of peace, brotherhood and love for the whole humanity. He guided people towards virtuous living and urged them to seek divine mercy. As a Divine Messenger, Jesus Christ is venerable to adherents of all religions. On this auspicious occasion, I wish to commend and appreciate the sincere efforts of our Christian community for the socioeconomic development of their motherland. I also take this opportunity to pay the highest tribute to the sacrifices made by our Christian brethren in Pakistan’s fight against terrorism. The Government of Pakistan holds sacrosanct the equality and freedom of conscience of all citizens irrespective of belief, creed or religion. Our commitment to this fundamental principle is firmly grounded in the teachings of Islam, the vision of Quaid-i-Azam Muhammad Ali Jinnah and the inviolable guarantees of our Constitution. We are committed to building a society that respects difference and finds strength in diversity; a nation that is tolerant and cohesive; and a state that provides equal rights and opportunities to all citizens. We are proud of our Christian brethren; they are an integral part of our multicultural polity; and I am confident that their patriotic contributions will continue to accelerate the pace of Pakistan’s progress. 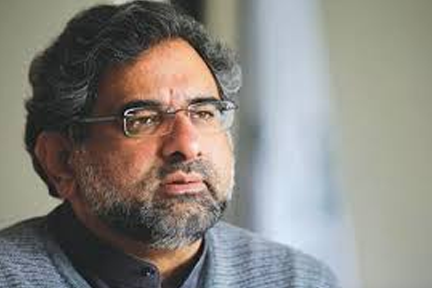 “On the joyous occasion of the birth of Jesus Christ, I congratulate Christians all over the world particularly the Christian community in Pakistan from the core of my heart. The birthday of Jesus Christ is a day to reiterate universal teachings of patience, tolerance, kindness and goodwill not only for the Christian community but for the whole mankind. Peace and happiness can be brought back to the world engaged in conflict of interests and wars by adopting these virtues. The lesson that we learn from the teachings of the Jesus Christ is that life and property of all people living on this planet should be given equal respect and protection without discriminating on the basis of color, cast, region and belief. Human beings should not be made fuel for fighting wars for materialistic interests but instead the valuable resources should be spent on the welfare and development of humanity. This is the best way to commemorate Jesus Christ. 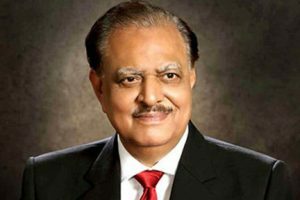 The services rendered by the Christian community of Pakistan for progress and stability of the country particularly in the fields of medicine and education are greatly valued by the people and Government of Pakistan. The Constitution of Pakistan guarantees equal rights for all minority communities including our Christian brethren and the Government of Pakistan is fulfilling its constitutional and moral responsibilities in this regard. Paris 23rd December, 2017. 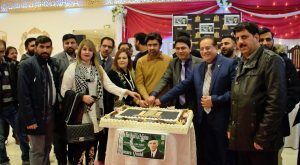 Jinnah Awards were given to the Pakistani and French higher achievers in the industrial sector of France as a part of the celebrations to mark the 141st birth anniversary of Quaid-e-Azam Mohammad Ali Jinnah. 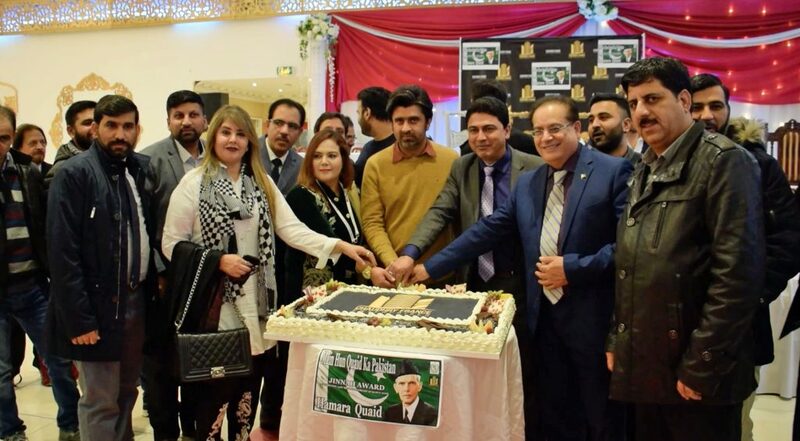 The ceremony held under the theme, “Hamara Quaid “and, “Main Hoon Quaid ka Pakistan” was organized by Mr. Asif Chaudhary, a top French businessmen of Pakistan origin and owner of Choudhary France Group of Industries in Paris, yesterday. 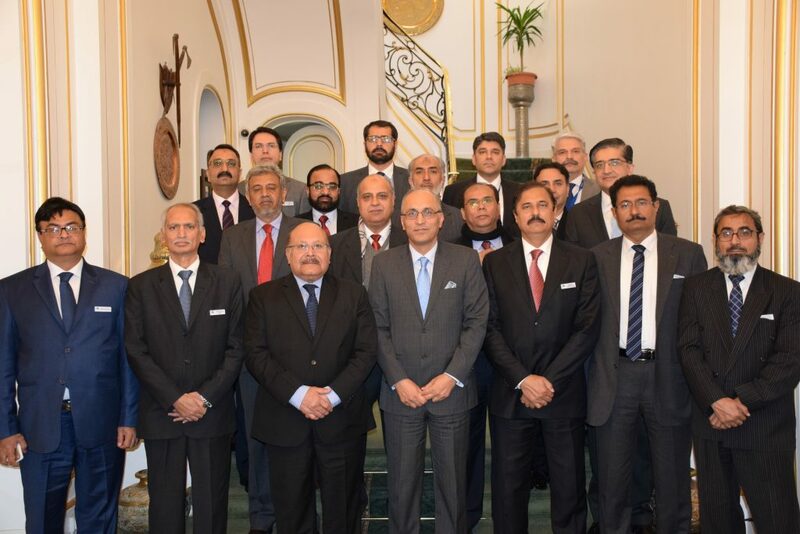 The event was attended by French and Pakistani businessmen, industrialists, members of the Pakistan community and media persons in large number. While speaking of the occasion the Press Counselor Mr. Qamar Bashir paid a rich tribute to the Quaid Azam Mohammad Ali Jinnah. He said that the Quaid was an accomplished lawyer, a great statesman, an inspiring leader and an upright politician who with his sharp judgment and political acumen created a separate homeland for Muslims of Indian subcontinent despite facing stiff resistance from the combine opposition of Hindus of India and the British government. Mr. Amir Abbas Anchor person and community leaders Mr. Asif Choudhary, Mr. Ibrar Kiyani, Mr. Umair Baig and Mr. Atiq ur Rehman during their speeches said that Quaid Azam successfully invigorated the Muslims of India who under his dynamic leadership finally carved for themselves a separate homeland on 14th August 1947 where they were able to lead their lives in accordance with their religious believes and social and cultural preferences. 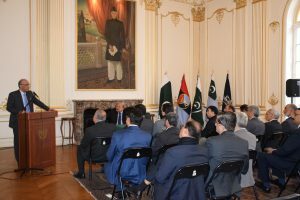 The speakers said that now Pakistan is one of the important country of the world and is playing its active and effective role in pursuance of peace progress and development in the region and around the world. They exhorted the Pakistani diaspora to remain committed to the Quaid’s golden and in cardinal principles of unity faith and discipline and should leave no stone unturned to make Quaid-e-Azam’s Pakistan into a strong, prosperous, moderate and a model state. A photographic exhibition was also held in the Embassy of Pakistan to France to mark the occasion. Paris, le 15 décembre 2017. 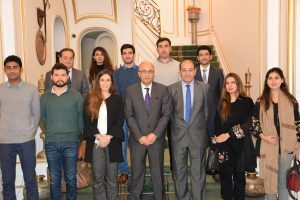 Les étudiants et les chercheurs pakistanais bénéficient du transfert de connaissances et de compétences grâce à un programme de formation spécialisé qui se déroule actuellement à Paris pour approfondir la coopération bilatérale dans le domaine de l’archéologie. Mme. Aurore Didier, Chef de la Mission archéologique française dans le Bassin de l’Indus (MAFBI) en a fait part lors de sa rencontre avec l’Ambassadeur du Pakistan en France, S.E. 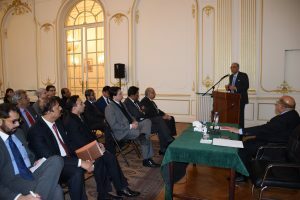 M. Moin ul Haque, qui s’est tenue aujourd’hui à l’Ambassade du Pakistan à Paris. Mme. Didier a également présenté les six étudiants pakistanais de MPhil/ Phd (maîtrise/ doctorat), qui sont actuellement à Paris pour suivre ce programme de formation. L’Ambassadeur a déclaré que la France et le Pakistan ont une longue tradition de coopération forte et continue dans le domaine de l’archéologie, remontant à la première mission sur le terrain d’une équipe archéologique française en 1958. Il et a noté que les importantes découvertes faites par l’équipe française au Baloutchistan et au Sindh, ont considérablement contribué à la compréhension des cultures et civilisations anciennes au Pakistan. Il a indiqué que l’ambassade prévoyait de célébrer les 60 ans de la première mission archéologique française au Pakistan en organisant un événement spécial l’année prochaine à Paris pour mettre en valeur la richesse historique et archéologique du Pakistan. L’Ambassadeur a également vivement apprécié le soutien de la MAFBI et du Ministère de l’Europe et des Affaires étrangères pour former des étudiants et des chercheurs pakistanais et leur inculquer les techniques de fouille et les compétences et les connaissances les plus récentes dans le domaine de l’archéologie. La mission archéologique française dans le bassin de l’Indus a été fondée en 1958 et depuis, elle a fouillé d’importants sites archéologiques au Pakistan comme Amri dans le Sindh, et Mehrgarh. Nindowari, Nausharo, Miri Qalat et Shahi Tomb au Baloutchistan. Paris 15th December, 2017. Pakistani students and researchers are benefitting from the transfer of knowledge and skills through a specialized training program being conducted in Paris to further deepen the bilateral cooperation in the field of archaeology. Dr. Aurore Didier, Head of the French Archaeological Mission in the Indus Basin (MAFBI) said this during her meeting with the Ambassador of Pakistan to France Moin ul Haque held at the Embassy of Pakistan, in Paris today. Dr. Didier also introduced second batch of 6 Pakistani M Phil/ PhD students, who are currently on a study tour in Paris. 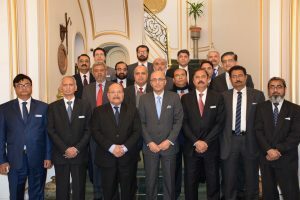 The Ambassador said that France and Pakistan have a long history of strong and continuous cooperation in the field of archaeology, dating back to the first field mission by a French archaeological team in 1958 and noted that the important discoveries made by the French team in Balochistan and Sindh, had greatly contributed to understanding of ancient cultures and civilizations in Pakistan. He said that the Embassy is planning to mark the 60 years of the first French archaeological mission to Pakistan by organizing a special event next year in Paris to showcase Pakistan’s historical and archeological richness. The Ambassador also deeply appreciated the support of MAFBI and French Ministry of Europe and Foreign Affairs for training of the Pakistani students and researchers and imparting them with latest excavation techniques, skills and knowledge in the field of archeology. The French archaeological mission in the Indus Basin was founded in 1958 and since then it has excavated major archaeological sites in Pakistan such as Amri in Sindh, Mehrgarh. Nindowari, Nausharo, Miri Qalat and Shahi Tomb in Balochistan. Paris 11th Decembe​​​​r 2017. Close and friendly relations between Pakistan and France are getting stronger through a series of new initiatives and exchange of visits in the political, economic, cultural and educational fields. 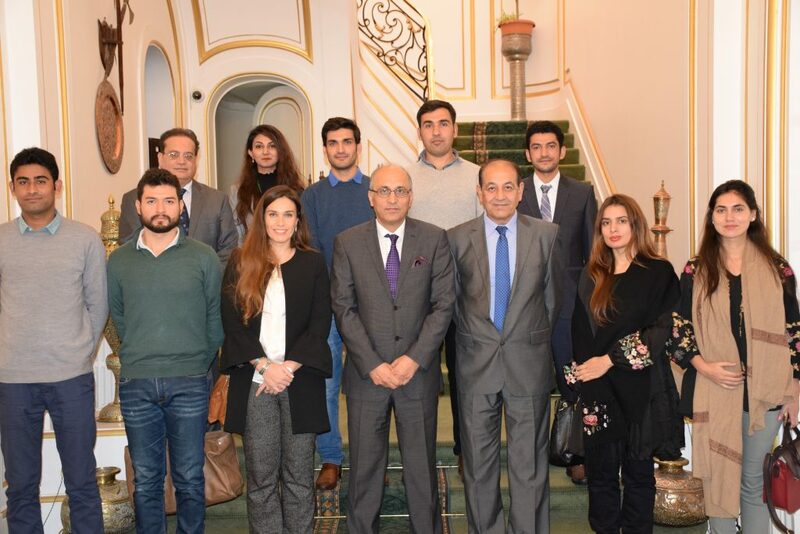 This was stated by the Ambassador of Pakistan to France Moin ul Haque while speaking with a delegation of 107th National Management Course, who called on him at the Embassy of Pakistan to France in Paris today. The 14-members NMC delegation is visiting France as part of their training course. The Ambassador said that this month two parliamentary delegations from France are visiting Pakistan while a delegation of the Senate of Pakistan is expected to visit Paris in January 2018. These contacts between our parliamentarians would contribute in a qualitative change in the bilateral relations, he added. The Ambassador noted with satisfaction that there has been a steady increase in the volume of bilateral trade over the last few years which has reached US$ 1.4 billion in 2016. France has remained a major investment partner of Pakistan with over forty French companies working in Pakistan. The recent announcement by the Renault group to set up a car plant in Karachi in partnership with Al Futtaim group is a welcome development. NMC delegation during their weeklong stay in Paris would have meetings/briefings at the Ministry of Economy, Ministry of Climate Change, French Parliament, National School of Administration (ENA), Centre of High Studies of Ministry of Interior (CHEMI), UNESCO and Mairie of Sarcelles.